On Saturday I took part in a performance in Northampton, England of the17 organised by Bill Drummond. 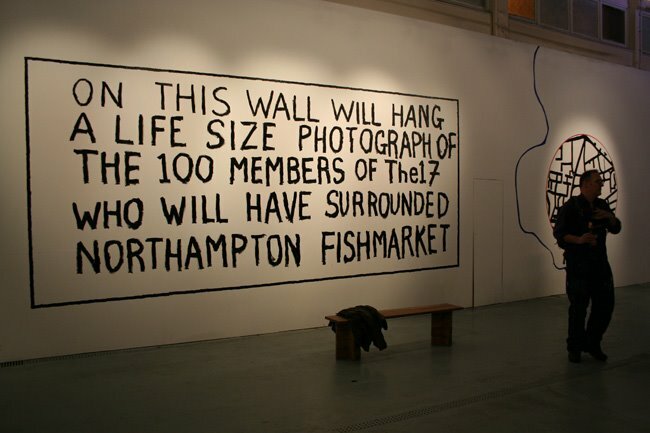 It began in the Northampton Fish Market Gallery. Bill Drummond is an art agitator in the UK that has been involved in a number of psychologically challenging projects (burning a million quid, taking an effigy of Elvis to the north Pole) and has a musical history that began with his management of Echo and the Bunnymen which he then left to form his own band – The KLF. Check out more about Bill here. His main output appears to be writing now but one of his ongoing music projects is a ‘post nuclear’ choir where Bill imagines that all music has dissapeared and we begin again from year zero. Having read Bills book about this project it prompted me to check out this event which was only an hours drive from where we were. As ever, leaving the house with my girlfriend can sometimes take longer than preferred and we left ourselves with 20 mins to get to Northampton fish market to register. Only the 1st one hundred people were to be allowed to register and take part. We broke the speed limit and got there to discover that the Northampton Fishmarket Gallery wasn’t so busy and we were numbers 7+8 on the registration form. My agitation at missing out dissipated but my girlfriends agitation at my agitation took a little longer to leave. The gallery was big and open. We had some nibbles, a cider and waited. 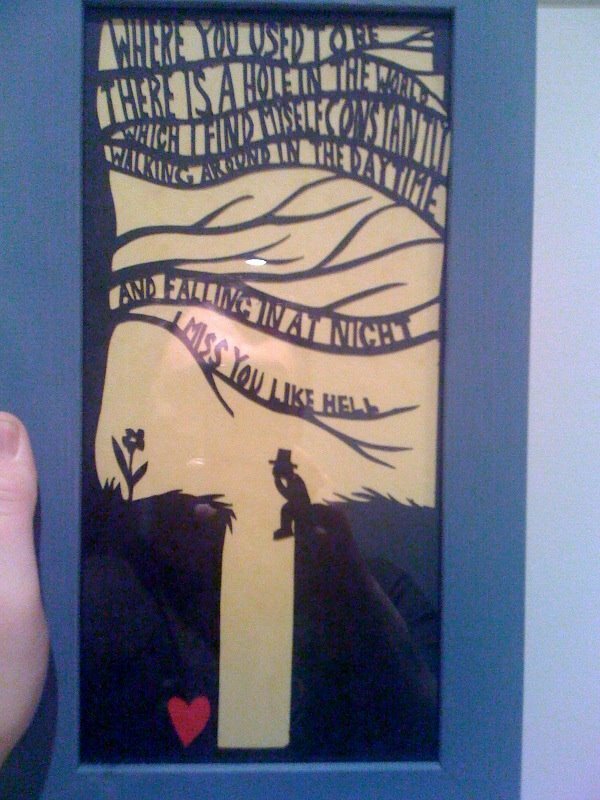 I bought a nice artwork made by cutting out paper. It showed a sad man with his feet dangling over a hole and at the bottom of this hole in the forest there was a red heart. All cut out of paper on yellow, black and one splash of red. We watched the mechanical pigeon on the rafters drop out it’s fake poo periodically and people slowly assembled. 1. The lady with a Vivienne Westwood stylings replete with bright red ’17 t-shirt’ and red hair. 3. The chique Nouvelle Vague t-shirt. I bought their record recently after trying on a tweed suit in Scotland and in some ways this was the most punk thing to wear to such an event. Nouvelle Vague are a band that ‘do’ classic songs from dark 80’s rock bands like Echo and the Bunneymen and further, do it in a latin lounge style with a succession of singers that never jump out but merely smoulder in the background. It’s a derivative of a derivative of a derivative. It’s the ultimate anti-the17 statement here. My girlfriend and me were taking part in a score called ‘Surround’. The full version of SURROUND will be performed in Beijing, China in August 2009 – we were at the English trial-run. Rather than use notation for scores Bill uses the everyman approach of plain text to describe how the choir should perform each score. 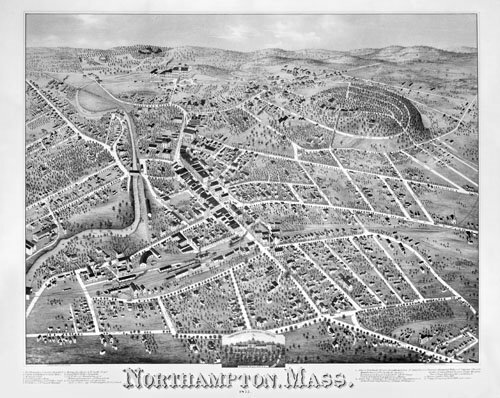 The idea in Northampton was to position 100 people around the streets of Northampton at intervals of 40-50m around a 5 kilometre circumference of a circle. Each spot was marked by a spray painted 17 logo on the pavement/wall/pole. The score was to pass on a throaty shout descending to the note A from note C around the circle 5 times among the 100 people. The complication of having each 10th person begin the shout simultaneously and then pass it on clockwise was jettisoned when the logistical difficulty of having them notified at the same time became tricky. I guess that would need either a firework or 10 mobile phones calling another 10 mobiles of every 10th participant. Quickly it was opted to have it begin with one person who would get a phone call to start. We got Bills inspiring intro to the concept and the piece Surround and he got us all to practise the ‘Hey Ho’ shout so we were confident. It had to be loud as not everyone had line of sight with one another. My girlfriend was relieved she didn’t have to sing ‘professionally’ or know what the note of C was but I was a bit disappointed that the only post-music expression I could input would be the volume or character of my shout. Other scores have called for chanting, free utterances or meditation on skylarks ascending. No matter. 100+ of us trooped out of the fishmarket following Bill. Each person was dropped off at their point. I wangled to get us dropped off early as I needed a pee and spotted an early 17 in spray paint outside a working mans club. A photographer took shots of everyones foot next to their spray painted 17 but mine was on a wall and I was full of pee so they had to take one of my face for safety. Being dropped off early meant there was time to kill until the other 85 people had trooped the 5km and been dropped off. We hung about and got to know our new neighbours dotted behind and in front of us. Ten minutes later the bloke near me decided to abandon his post as he needed to get his bus. This was a bit of frustration as the magic line and number had been broken. 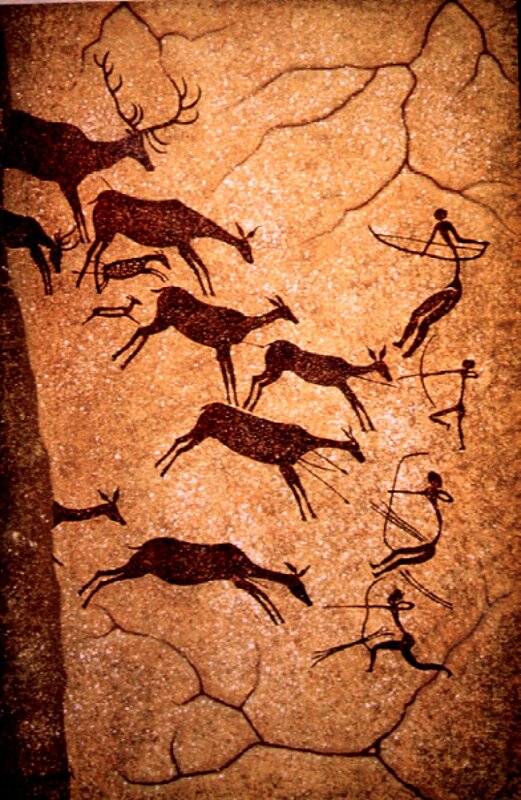 Bill was obsessive about there being exactly 100 otherwise it ‘wouldn’t work’. I spoke to our line and said to ask passers by. One of the girls two numbers up the line managed to call a friend and get her down. She would be here in 10 minutes. Passers by in cars were hooting and noticing the pattern of people on the street. It was fun in the build up. The replacement member of the 17 choir arrived 4 seconds before we had to do our thing. Destiny called out and we were not found wanting. We all shouted ‘hey ho’ five times to one another and passed our energy around the circle. Shout number 3 seemed to be far too quick after shout number 2 and I susepct that a mis-fire happened somewhere along the line. We trooped back to the Fishmarket Gallery to get our photo taken – drunkards from the pub were shooed out of the shot which would be only of the 100 with the photo being displayed on the wall of the gallery. I’m the one with the coffee cup and glasses. I love the concept but not the one I was in. The realisation of the score didn’t touch on the new concepts of music I was hoping it would. I wanted a less mechanised shout and something that could evolve further and go deeper. The ‘piece’ was too short. Short burst versions of the17 (i.e. less than 3-4 minutes) don’t prompt the participants to reveal more of themselves to one another. This score didn’t require anything other than good natured but ultimately distant participation. For most of the other Scores Bill did an audio recording of the event and then played it back at the end. Importantly, for Bill, the recordings were always deleted when the participants had heard it only once – the only remnant being in memories or Bills book notes. For events that didn’t take place in the same temporal timeframe (i.e. recording 4 different schools on four different days) he collated and layered them on top of one another for playback and subsequent deletion. I would have liked to have seen an attempt to record our piece – it could have been done on a) our mobile phones b) an omni directional from a silent helicopter or kite;) or c) from 5 or 6 strategically positioned mics. I miss the ceremony of playback and deletion that the book pimped. At the end of the piece I said a quick Hello to Bill and told him I’d mail him about Electroraga. Check out the17.org, take part, challenge your thoughts about music.